Nick Lee's biggest weapon is pace. That's just off guys in this thread, I'm sure there's more. Does DeSanto have a higher pace rate than Lee, or is it the combination of pace and physicality that gives him the edge? 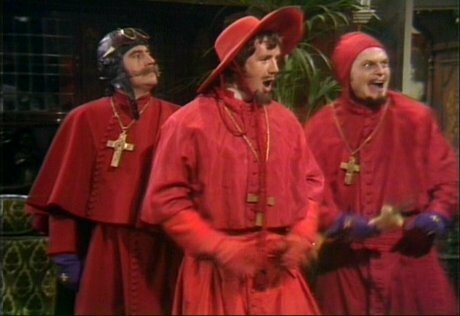 I wasn't expecting the Spanish Inquisition! Micah Jordan and Kollin Moore are constantly on the attack. How about the slowest pace . . . The Silver Sloth Award? Of course, it is tempting to name a slew of heavyweights, who are admittedly more ballasted by gravity. Vito is high pace but DeSanto is even more. That’s why I keep saying Tucker’s win last year wasn’t a fluke and hope they matchup up in the tournament. Kollin Moore was an animal as a frosh, but he's seemed decidedly less so since then. Not a slow-paced wrestler, per se, but not the same. Spencer Lee in the first period, a straight slug after that.